Text boxes and most shapes can include text in them. The text can be positioned horizontally or vertically, and it can appear on one line or wrap to multiple lines. You can change the direction of the text, and you can also change the margins of text boxes and shapes for optimal spacing, or resize shapes for a better text fit. Lines and connectors are shapes that can't have text in them. In a shape or text box, you can change the direction in which text is read. That is, you can pivot text 90 or 270 degrees so that it appears sideways. Right-click the edge of the shape or text box. On the shortcut menu, select Format Shape. In the Format Shape pane, click Size/Layout & Properties . Under Text Box, select the option that you want in the Text direction list. The Stacked option is available in PowerPoint and Excel, but not Word. Insert a text box or shape in your document, and then type and format your text. Right-click the box or shape and select Format Shape. In the Format Shape pane, select Effects. Under 3-D Rotation, in the X Rotation or Y Rotation box, enter 180. (Optional) If your text box becomes filled with a color, you can remove the color in the Format Shape pane. Under Shape Options, click the Fill & Line tab , expand Fill, and select No fill. (Optional) To remove the text box outline, right-click the text box, click Outline in the mini toolbar that appears, and choose No Outline. Click in the paragraph or line of text that you want to modify. On the Home tab (or the Message tab in Outlook), click the horizontal alignment option that you want. Click the border of the shape or text box to select it. On the Home tab, (or the Message tab in Outlook), click the horizontal alignment option you want. 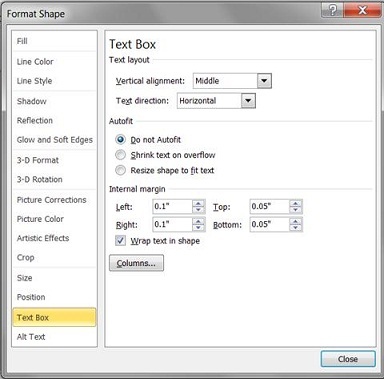 Right-click the border of the shape or text box. On the shortcut menu, click Format Shape. Select the option that you want in the Vertical alignment list. When text wraps, it automatically continues on a new line as it reaches the right border of the shape or text box. 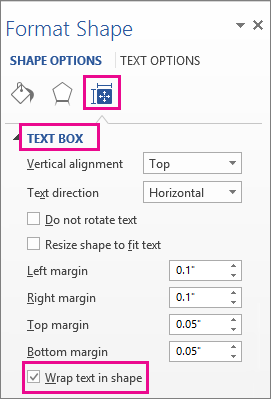 Right-click the border of the shape or text box that contains the text you want to wrap. 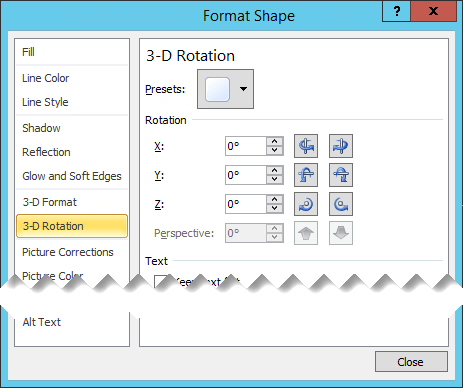 In the Format Shape pane, select Size/Layout & Properties , and then select Wrap text in shape. The margin is the distance between the text and the outer border of the enclosing shape or text box. You can automatically increase the size of a shape or text box vertically so that the text fits inside it. In the Format Shape pane, click Layout & Properties , click Text Box, and then select Resize shape to fit text. Tip: You can reduce the size of the text to fit it in the shape or text box by clicking Shrink text on overflow. You can change direction of text in a shape or text box. For example, you can rotate text 90 or 270 degrees so that it appears sideways. Right-click the edge of the shape or text box that contains the text. In the left pane of the dialog box, select Text Box. Under Text layout, select the option that you want in the Text direction list. For additional information about the options in the Text Box pane of the Format Shape dialog box, click Help at the top of the dialog box. 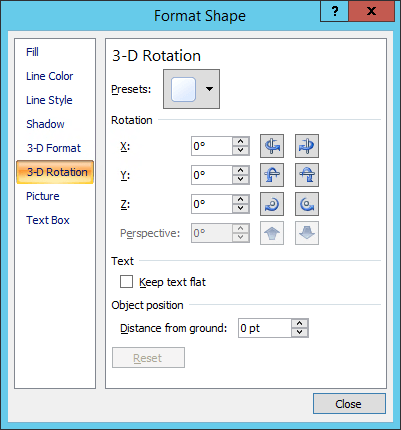 In the Format Shape dialog box, select 3-D Rotation on the left. In the X box, enter 180. On the Home tab, (or the Message tab in Outlook), click the horizontal alignment option that you want. On the shortcut menu, click Format Shape, and then click Text Box in the left pane. Under Text layout, select the option that you want in the Vertical alignment list. Right-click the border of the shape or text box that you want to resize. Under Autofit, click Resize shape to fit text. The internal margin is the changeable distance between text and the outer border of a shape or text box. To specify the distance between the left border of a shape and the text, enter the new margin number in the Left box. To specify the distance between the right border of a shape and the text, enter the new margin number in the Right box. To specify the distance between the top border of a shape and the text, enter the new margin number in the Top box. To specify the distance between the bottom border of a shape and the text, enter the new margin number in the Bottom box. You can change the direction of text in a shape or a text box between horizontal (left to right) and vertical (from the top to the bottom or from the bottom to the top). Double-click the shape or text box to select it and open the Format tab. On the Format tab, in the Text group, click Text Direction . You can click Text Direction multiple times to cycle through the three options (Rotated 90 degrees, Rotated 270 degrees, Horizontal). With the text box selected, on the Home tab, in the Paragraph group, click Text Direction and select the option you want. Resize the text box as needed to make the text fit properly in it. In Office 2007, you can rotate text in Excel or PowerPoint, but not in Word. For a shape, on the shortcut menu, click Format AutoShape, and then click the Text Box tab. For a text box, on the shortcut menu, click Format Text Box, and then click the Text Box tab. Under Vertical alignment, click the option that you want. On the shortcut menu, click Format Shape, and then click the Text Box tab. When you wrap text, the text automatically starts a new line as you reach the right border of the shape or text box. Right-click the border of the shape or text box that contains the text that you want to wrap. For a shape, click Format AutoShape, and then click the Text Box tab. Note: The Text Box tab is unavailable in a shape unless the shape contains text. For a text box, click Format Text Box, and then click the Text Box tab. Under Options, select the Word wrap text in AutoShape check box. Select the Wrap text in shape check box. 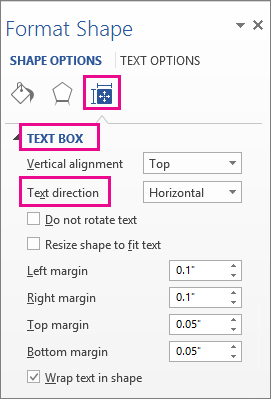 Right-click the border of the shape or text box that contains the margin that you want to adjust. Under Internal margin, enter new margin numbers in the Left, Right, Top, and Bottom boxes to specify the distance between the borders of the shape and the text. 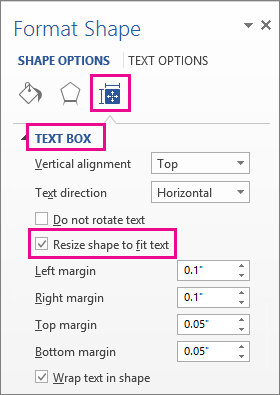 Under Options, select the Resize AutoShape to fit text check box. Under Autofit, select Resize shape to fit text. Tip: You can reduce the size of the text to fit it in the shape or text box by selecting Shrink text on overflow.